Leather strap watches are a popular choice for many men and women today. Whether it’s the supple quality and luxurious feel that leather gives, the ability to coordinate the strap color with the rest of a fashion ensemble or the time-honored vintage appeal, leather watches are prominently featured in many prestigious watchmakers’ collections and are among their best-selling styles. The use of leather straps on timepieces actually dates back to the origin of wristwatches in the early 1900s, when Louis Cartier designed the Santos Watch for aviator Alberto Santos-Dumont, who required a timepiece he could wear on his wrist while flying. A pocket watch which was widely used at this time was considered too cumbersome to handle in flight. The first Cartier Santos watch featured a slender metal tank case presented on a leather strap. Prior to this, wristwatches featuring small cases and embellished jeweled bracelets were designed for women. Leather wristwatches have continued to remain popular even after 1950’s, when many watchmakers started to offer bracelet models for both men and women. Leather strap watches are the focus this week at luxury retailer TheWatchery.com. with the site’s Leather Watch Classics Event. Over 400 men’s and women’s timepieces are featured in the promotion, including styles from Breitling, Cartier, Versace, Lucien Picard, Invicta, Bvlgari, Maurice Lacroix, Oris, Gucci, Eterna, Bulova Accutron, Bedat & Co., Ritmo Mundo and Michael Kors. 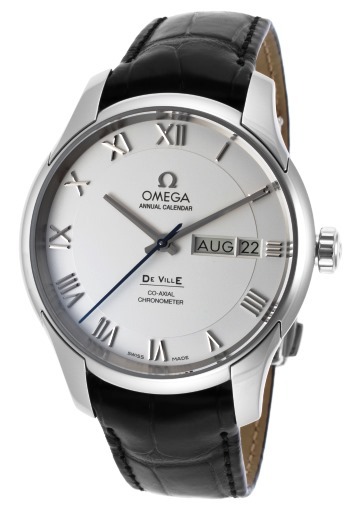 The Omega De Ville Annual Calendar watch is an outstanding selection. Impressive in design, unsurpassed in excellence this prestigious men’s Swiss-made automatic timepiece is a certified Chronometer, a certification of precision awarded by the COSC (Official Swiss Chronometer Testing Institute). The perfectly round, premium-grade stainless steel case highly polished to a mirror-bright glow and is presented on a handsome crocodile-textured black leather strap with a costly deployment clasp. The stationary polished steel bezel surrounds the silver colored dial with an automatic month and date calendar, baton hands and Roman numeral hour markers. A skeleton crystal caseback lets you see the intricate automatic movement inside. Features include a scratch-resistant sapphire crystal above the dial and water-resistance to 100 meters or 330 feet. Men’s automatic watch is 41mm in diameter and 15mm thick. Complementary delivery and returns are included on all domestic purchases within the continental US at TheWatchery.com.